This beaten-down retailer might just surprise you this summer. Department store chain Sears Holding Corp. (SHLD has been Wall Street's punching bag in 2017, the manifestation of the bricks-and-mortar retail rout that's been taking place as e-tailers like Amazon.com (AMZN - Get Report) replace the shopping mall for consumers. No doubt about it, Sears has been an awful stock to own in recent years - in the past five years, Sears has lost about 83% of its market value, plunging at the same time that the S&P 500 was undertaking a massive multiyear rally. But long-suffering shareholders could be in store for a reprieve in Sears this summer, at least in the short-term - in fact, shares are just a dollar away from opening the door to a more substantial rally. Long-term, Sears' downtrend is still intact. But zoom in a bit on the chart, and things start to look more constructive for Sears bulls. Shares have spent the past few months forming an inverse head-and-shoulders pattern, a bullish reversal pattern that signals exhaustion among sellers. After the prolonged selloff this stock has seen over the past few years, it's not hard to imagine why sellers might be winded at this point. The inverse head-and-shoulders pattern is formed by two swing lows that bottom out at approximately the same level (the shoulders), separated by a lower low (the head). The buy signal comes on a move through Sears' neckline - that's currently at the $9.50 level. 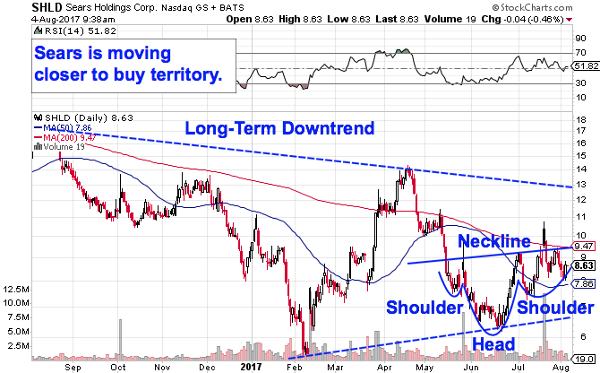 Simply put, if Sears can materially clear the $9.50 level, then shares open up considerable upside potential to around the $13 price level. That materiality is important - shares briefly blipped above $10 in July, only to close back below $9 the next day in a classic bull trap. Wait for two consecutive closes above $9.50 before you pull the trigger on the Sears trade. Longer-term, higher lows from February's bottom could converge with the long-term downtrend that's been in play for more than a year now. That's a technical standoff of sorts that could lead to a change in trend in Sears - but it's still a long way away at this point. The price level to watch first is our breakout level at $9.50. Sears still has plenty of issues with its business - but for a short-term stock trade, this department store chain is just a dollar away from a significant rebound in 2017. Keep a close eye on this one. If it happens, it'll happen fast.